Rory McIlroy has a problem with Keith Pelley, chief executive of the European Tour. Without knowing the facts behind that particular situation, it is impossible to properly assess the player's decision not to compete in the Dubai Duty Free Irish Open at Lahinch in early July. 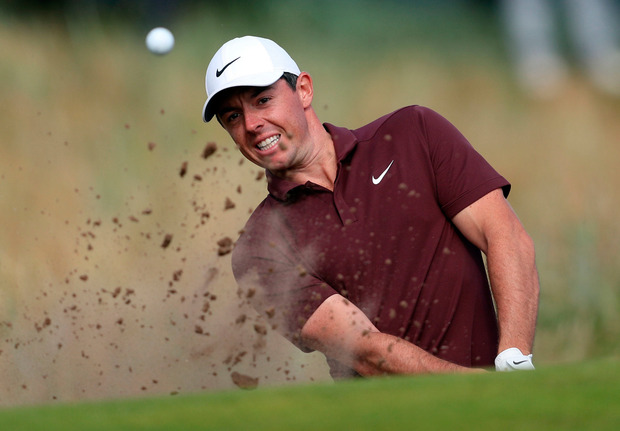 "Of course it's a disappointment, but I pretty much expected it, having spoken to Rory in Dubai last November," said John Gleeson, chairman of Lahinch's Irish Open committee. "We're confident of having a strong field and I just hope that potential critics remember the great things Rory has done for this event." The latter point is well made. As is the truth of the old adage about eaten bread being soon forgotten. The fact is that challengers at Lahinch wouldn't be playing for a prize fund of $7m (€6.2m) but for McIlroy. In fact, it's debatable if a recently struggling tournament would even exist, but for his intervention prior to Royal Co Down four years ago. Colm McLoughlin, CEO of Dubai Duty Free, has repeatedly noted the debt the tournament owes to McIlroy. As recently as last November, he told the Sunday Independent: "It has been a pleasure working with Rory . . . he has done a great job." Earlier, he made the point: "I think Rory's involvement cannot be overstated. I think he's a fine young man." McIlroy has set his sights on winning the Open Championship on its return to Royal Portrush later in July. In fact, he raised quite a few eyebrows by telling the BBC last week, "If I could pick one tournament to win this year, it would be Portrush. I would definitely have Augusta on the backburner." The rationale is fairly simple. Having decided that playing the previous week would be his best preparation for a Major challenge, he would be committed to three tournaments in a row if he opted for Lahinch. So he's passing up the Irish Open in which he had a spectacular victory at The K Club three years ago, securing the title with eagles at the long 70th and 72nd holes. These are very personal decisions for a player of his calibre. I certainly don't know how he might expect to feel if he played three successive events. Or if he opted out of the Scottish Open and had a blank week prior to Portrush. This being Ireland, however, there are those with the scalpels out, just as there were when the issue arose as to whether he would represent the Britain or Ireland at the Rio Olympics. While he didn't handle that situation especially well, he can't have been impressed by the widespread denial of his right to choose. Dipping seriously into the past, I can recall the remarkable impact Christy O'Connor Snr had on the Carrolls International, notably on the occasion of his victory at Royal Dublin in 1966 and on its eight subsequent stagings at Woodbrook, where he won in 1967 and 1972. Since then, the only Irish player to match that impact on a home event has been McIlroy. And he did it both on and off the golf course through the charitable work of the Rory Foundation. Which should lend a little more objectivity to his July endeavours.